This variation stems from the 4-4 point 3-3 invasion page. Instead of extending at a as in the usual sequence, Black can play the double hane at . Black will do this if he is prepared to take the corner at some extra cost or, if White resists, fences in White in the corner, or to keep the initiative. Although this is called joseki, and is a common technique, some variations are difficult, and are affected by stones near the circle-marked point. A straightforward variation is when cuts and captures what has become a cutting stone. 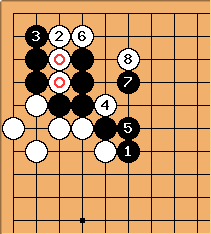 Black can then sacrifice the cutting stone and capture the corner. The double hane has played the role of cut the side you don't want. Subsequently, may become a big point, igniting a pushing battle by threatening the hane at a. For this reason, at would be slack. Typically Black responds at if he chooses not to ignore , and up to is a common sequence. Note that if Black plays at , then Black loses the corner: see the next diagram. 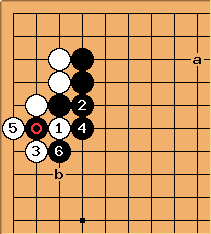 Black would probably like to play the double hane of in this diagram, but here the aji of the marked white stones come into play. White can retake the corner -- or worse. 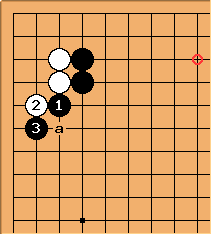 This side stepping by Black does not really produce a good result, leaving weaknesses at a and b in gote. 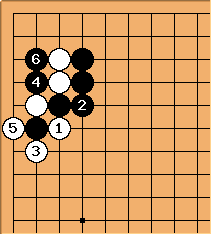 This is especially as Black usually chooses this joseki (double hane after the 3-3 invasion) when a wall facing the top side is not very valuable, opting instead to take points in the corner. If White gets the marked stone in place, will either link up as in the diagram or capture the marked black stones. The other aji is that and threaten to extract the marked stones in the same way as above, so that becomes almost absolute sente. This in itself is not so bad, but it could be a minus if Black's reason for not following the standard sequence was that the top side is not interesting. 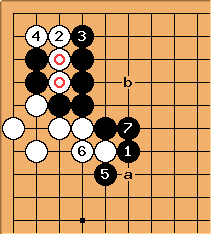 According to GoBase, Black's responses to include a, b and c. If Black has a suitable extension on the right side, Black can also respond at d.
If White chooses to tenuki, Black may choose to exchange with . 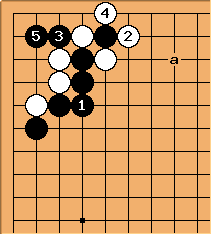 Subsequently, Black may hane at a, but in professional games Black is also seen to tenuki after the exchange (simply to prevent White from getting ). If Black has support on the left side, say , then Black may elect to attack at . In professional games, is seen replying at either a or b. 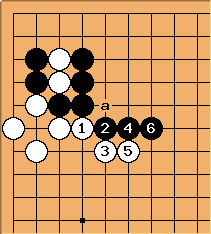 Note that without the support of stones such as , a Black move at is very likely to end up being a misplaced stone. @ . White must not play at or Black will take the corner as in the above, while increasing his influence. In this variation, Black can now take the initiative to play elsewhere, extend his wall around a or increase his influence towards centre and sides at b. If Black plays the double hane, Black has to be prepared for this . White intends to give up the corner in exchange for a position on the top. 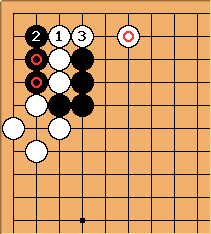 In an emergency, however, instead of Black may play at a; the likely outcome is that he gives up a bit more territory in the corner in order to maintain his outside wall. 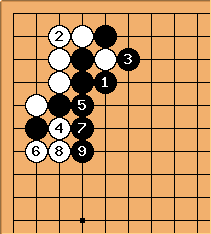 After in the previous diagram, is the joseki move, reaffirming the unity of the black stones. 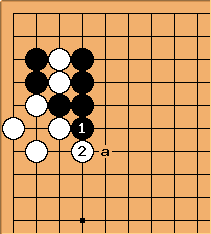 After , White can secure a base with a move like a or play tenuki. With in place, Black can resist. 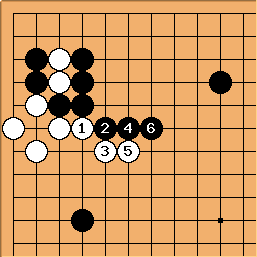 White can live - very small in the corner or belatedly take the other ponnuki starting at a. However this is worse than taking the other ponnuki directly. After the variation "taking the corner" White will most likely continue with these moves. 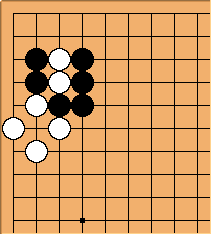 In most cases, when White invades at the 3-3 point, Black has stones on both sides, at or around the places shown here. 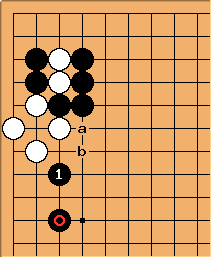 Black's left side stone has lost much of its value after this sequence. 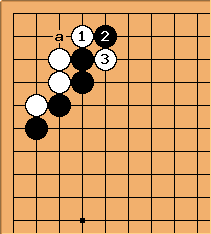 In White's counter hane variation, this atari play is recognised as joseki, but is highly sensitive to stones on the upper side, for example at a or b in the following diagram. These plays occur in pro games. 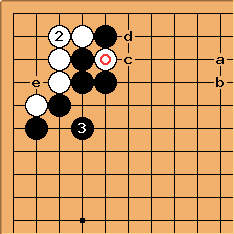 When Black plays , White will eventually have to live at e. Before that White has a chance of pulling out the marked stone with White c, Black d and White continuing on the third line for a while. The books teach that this is good for White if Black has a stone at b, but poor if Black has a stone at a. 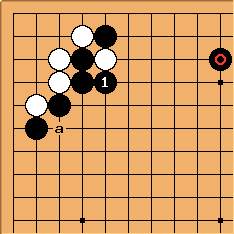 If White lives immediately at e and Black tidies up by capturing at c, Black will be thick anyway (possibly slightly overconcentrated). There's an early example in Chapter 1 of Beauty and the Beast.